Alert! The winners of the 2011 Sunday Times Literary Awards were announced at a gala banquet in Johannesburg this evening. Sifiso Mzobe’s novel, Young Blood, beat a field that included Ivan Vladislavic’s Double Negative to take the R75 000 Fiction Prize – thus denying the latter a hat trick of wins, as Double Negative had already been awarded the UJ Prize and M-Net Literary Award – while Ronnie Kasril’s tribute to his late wife, Eleanor, The Unlikely Secret Agent, received the R75 000 Alan Paton Award for non-fiction. Young Blood was published by Kwela, an imprint of NB Publishers; The Unlikely Secret Agent was published by Jacana Media. Earlier this year, Mzobe’s novel, the author’s first, was awarded the Herman Charles Bosman Prize at the Media24 Books Literary Awards – which, however, are only for books published by Media24. With the most prestigious of South Africa’s prizes now secured for his literary cv, Mzobe follows in the footsteps of the 2008 winner – Ceridwen Dovey’s Blood Kin was also a debut – and, depending on how you count it, Andrew Brown and Coldsleep Lullaby (Brown’s first novel, Inyenzi was initially self-published; Lullaby was his first eligible book). South Africa is in crisis and the white state is under siege. On 19 August the dreaded Security Police swoop on Griggs bookstore in downtown Durban and arrest Eleanor, the daughter of the manageress. They threaten to “break her or hang her” if she does not lead them to her lover, “Red” Ronnie Kasrils, who is wanted on suspicion of involvement in recent acts of sabotage, including the toppling of electricity pylons and explosions at a Security Police office in Durban. The Unlikely Secret Agent is the remarkable story of a young woman’s courage and daring at a time of increasing repression in apartheid South Africa is told here for the first time with great verve and élan by Eleanor’s husband, Ronnie Kasrils, who eventually became South Africa’s Minister of Intelligence Services in 2004. Kasrils, a lightning-rod figure in South African politics – for his role in the struggle and post-liberation government, and for his criticism of Israel – is also the author of a bestselling memoir, Armed and Dangerous. Last year’s winners were Imraan Coovadia and Albie Sachs. For the 2011 Sunday Times Literary Awards shortlists, click here. Tonight’s announcements fairly bring the year’s lit prize season to a close. 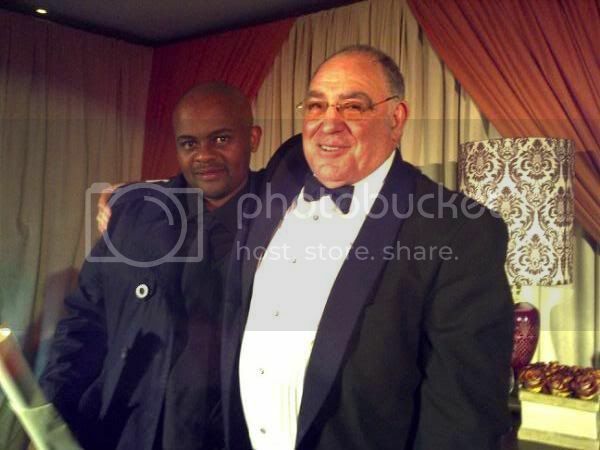 Congratulations to Mzobe and Kasrils – and to all who’ve been recognised in the past six months! Formeer spy chief Ronnie Kasrils has won the 22nd Alan Paton award for non-fiction at the Sunday Times literary awards. Kasrils, who quit as minister of intelligence in 2008, took the R75000 prize for his memoir of his late wife, Eleanor, The Unlikely Secret Agent (Jacana). Sifiso Mzobe, who works for a community newspaper in KwaZulu-Natal, won R75000 and the 11th Sunday Times fiction prize for his debut novel, Young Blood, published by Kwela Books. Post updated! Now featuring video clips of the acceptance speeches (and of Loyiso Gola's comedy), plus a Flickr gallery. Have amended this post to include Tymon Smith's coverage of the awards. Tune into eTV tomorrow morning (28 June; 7.40 AM) to catch Sindy Mabe interviewing Sifiso Mzobe.